The Seahawks will be looking to make it to their third straight NFC Championship Game when they face the Panthers in Carolina on Sunday. The Seahawks are fortunate to be playing in this game, as they really only defeated the Vikings in the wild card round thanks to a missed Blair Walsh chip shot. Seattle escaped with a 10-9 victory as a 4.5-point favorite, but the team will not be happy with the way that it played. The Seahawks must do better offensively against a Panthers team that went 15-1 this season. Carolina lost only one game this season SU and was dominant ATS too, going 11-5 on the year. The team did, however, play a week schedule. When these teams met in Seattle on Oct. 18, the Panthers shocked the Seahawks with a 27-23 victory as seven-point road underdogs. Seattle let that game slip away and is still 3-1 SU in this head-to-head series over the past three seasons. The Seahawks have won their last two games in Carolina and both of those contests went Under the total. One trend working in the Seahawks’ favor is that the team is 8-1 ATS after having won four of its past five games over the last two seasons. The Panthers, however, were 6-0 ATS in games where the line was +3 to -3 this season. TE Luke Willson (Concussion) and RB Marshawn Lynch (Abdominal) are questionable for Seattle and RB Jonathan Stewart (Foot) is questionable for Carolina. The Seahawks have the league’s best defense and that is going to keep them in games. Seattle allowed just 17.3 PPG this season (1st in NFL) and they’ve allowed just 58 points over the past six games. This team is clicking on defense and will just need Russell Wilson to lead the offense on a few scoring drives in this one. Wilson had a tough time getting things going against Minnesota in the wild card round, throwing for just 142 yards with one touchdown and one pick. Wilson also wasn’t at his best the last time he faced the Panthers, going 18-for-30 with 241 yards and a touchdown in the loss. It wasn’t a poor outing for Wilson, but he did throw for 24 touchdowns and just one interception over the final seven weeks of the season and is capable of having some explosive games. He’ll need to channel that type of play on Sunday or his team may be going home early. Doug Baldwin will be the guy that Wilson is looking at in this one. He caught five passes for 42 yards and a touchdown against the Vikings and emerged as one of the league’s top receivers late in the season. He’ll need to shake free for some big plays in this game. The Panthers were one of the best teams in football during the regular season and the team did it on both sides of the field. Carolina was dominant offensively, putting up 31.3 PPG (1st in NFL) with Cam Newton leading the way. Defensively, the Panthers were giving up just 19.3 PPG (6th in NFL). It’s good that Carolina is balanced, as the team will need to bring it on both ends against this experienced Seattle team. Cam Newton’s play will, however, determine the outcome of this game for the Panthers. When he faced the Seahawks earlier in the season, Newton threw for 269 yards, one touchdown and one interception and he also rushed for 30 yards and a touchdown. He was very good in that game, but turnovers were an issue. If he wants his team to avoid being the one that peaked in the regular season then he will need to take care of the football on Sunday. Greg Olsen is Newton’s favorite target all over the field. He had seven catches for 131 yards and a touchdown in the first meeting with Seattle. If he can come anywhere near matching that production then the team should be in good position to win the game. One big plus for the Panthers in this game is that Jonathan Stewart is set to make his return. Stewart rushed for 989 yards and six touchdowns this season and really adds another element to the Carolina offense. If he is healthy then he will really help the team in this one. Under is 4-0 in Seahawks last 4 games after allowing less than 15 points in their previous game. Under is 4-0 in Seahawks last 4 games after allowing less than 250 total yards in their previous game. Under is 4-0 in Seahawks last 4 games following a straight up win. Panthers are 4-0 ATS in their last 4 home games. Panthers are 5-0 ATS in their last 5 games on grass. Over is 4-0-1 in Panthers last 5 games after allowing less than 15 points in their previous game. Under is 5-0 in the last 5 meetings in Carolina. 1. No. 1 seeds are 21-4 in the NFC Divisional Round since 1990. 2. The Seahawks had won five in a row against Carolina, including a 31-17 victory in last season's playoffs, prior to the loss in Week 6. 3. The Panthers have won 11 consecutive games at home. The Broncos host the Steelers on Sunday and a spot in the AFC Championship Game will be on the line. The Steelers are coming off of an 18-16 victory over the Bengals in Cincinnati in the first round of the playoffs. Pittsburgh drove down the field and won on a field goal by Chris Boswell that would have been a lot further away had it not been for a few boneheaded penalties by the Bengals. The Steelers have now won two straight games and they are allowing just 14.0 PPG in those contests. The Broncos, meanwhile, have not played since defeating the Chargers 27-20 as 10-point favorites at home in Week 17. Denver won each of its final two regular season games, but the team did not cover in either. The Broncos and Steelers met in Week 15 and Pittsburgh came out on top in that one. The Steelers won 34-27 as seven-point home favorites in that game and it was the only meeting between these teams in the past three seasons. Denver is, however, 5-2 SU and 4-3 ATS when facing Pittsburgh in Denver since 1992. There are a few trends in this game that bettors will want to be aware of. The Broncos are just 0-6 ATS in home games after gaining six or more yards per play in two straight games over the past three seasons. It isn’t all bad for Denver, though, as the team is 7-0 ATS after failing to cover the spread in three of its past four games over the past three seasons. RB DeAngelo Williams (Ankle) is questionable for the Steelers and both QB Ben Roethlisberger (Shoulder) and WR Antonio Brown (Concussion) are listed as questionable, but are expected to suit up in this game. For Denver, LB Demarcus Ware (Knee) is listed as questionable, but it would be surprising if he doesn’t play in this one. The Steelers were able to escape Cincinnati with a victory, but the team suffered a number of injuries in the process. Both Ben Roethlisberger and Antonio Brown got hurt and it would be a major blow to Pittsburgh if those guys weren’t playing at the level they are capable of. Roethlisberger will almost certainly have some trouble in this one, as he could barely throw the ball down field when he came back in against the Bengals. The Steelers will have to simplify the playbook and work in a lot of screen passes and short timing routes to allow Roethlisberger to take it a bit easy in this one. Antonio Brown, meanwhile, should be able to play like his normal self as long as he is cleared for this game. Brown had 16 receptions for 189 yards and two touchdowns the last time these teams played and will certainly be all over the field in this one. Defensively, Pittsburgh will need to step it up with Roethlisberger injured. The Steelers cannot expect as many points as usual and will need to prevent the Denver offense from exploding on Sunday. The Broncos finished the season with two wins and Peyton Manning is back under center for Denver. Manning entered the game after Brock Osweiler struggled against the Chargers and the veteran quarterback completed 55.6% of his passes for 69 yards in relief of him. Manning read the defense well and showed enough to prove to Gary Kubiak that he should be starting in this game. One thing Manning will need to do is avoid turning the ball over. Manning threw for just nine touchdowns this season and had a miserable 17 interceptions. He cannot afford to put the ball in the hands of Ben Roethlisberger, no matter how healthy the Steelers quarterback may or may not be. Another thing Manning will need to do is target Emmanuel Sanders. Sanders lit up the Steelers the last time these teams met, hauling in 10 catches for 181 yards and a touchdown. He also rushed for 24 yards in that game. The Broncos will need to get him involved in this one. The running game will also need to be strong on Sunday. Ronnie Hillman and C.J Anderson combined for just 62 yards on 18 carries the last time these teams met and they will need to be a lot better with Peyton Manning playing quarterback. Steelers are 0-3-1 ATS in their last 4 playoff road games. Steelers are 0-3-1 ATS in their last 4 playoff games. Broncos are 0-4 ATS in their last 4 Divisional Playoffs games. Broncos are 1-5 ATS in their last 6 playoff games. Broncos are 1-5 ATS in their last 6 games in January. Steelers are 1-5 ATS in their last 6 meetings. Over is 4-1 in the last 5 meetings in Denver. 1. Denver S Darian Stewart told reporters he would be "cutting" Pittsburgh C Cody Wallace, who was fined last month for diving at S David Bruton after the whistle. 2. Bryant, who had a touchdown catch last week, recorded a season-high 10 receptions in the previous meeting with the Broncos. 3. 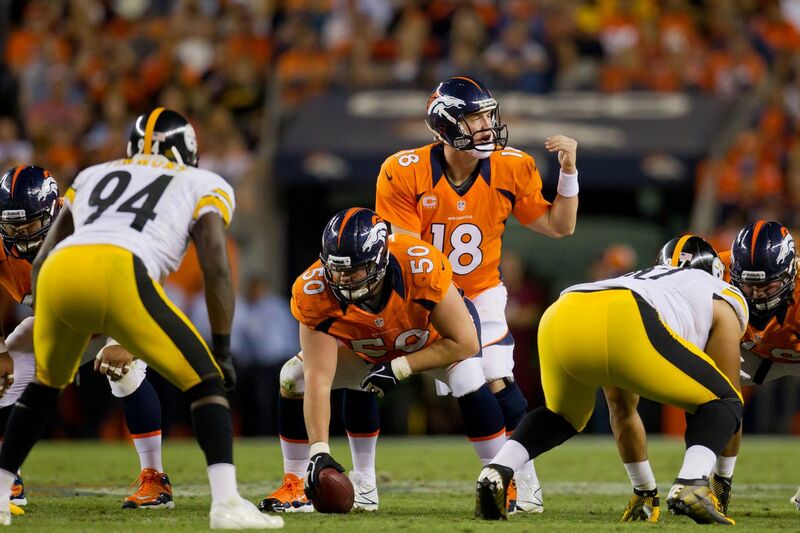 Denver led the league in fewest passing yards allowed (199.6) while the Steelers ranked 30th (271.9). JLB'S PREMIUM *VIP* PICK: $1,500 STEELERS @ BRONCOS "CASHOUT TOP PLAY"
INCARCERATED BOB'S *VIP* PICK: $2,000 BRONCOS VS STEELERS "BIG BOY BET"